A large team of researchers affiliated with several institutions in China has learned more about a type of snailfish that lives in the deepest parts of the ocean. In their paper published in the journal Nature Ecology and Evolution, the researchers describe sequencing the genome of the fish and what they learned from their study. Pseudoliparis swirei are a type of snailfish that live at the bottom of the Mariana Trench—they are known informally as hadal snailfish because they live in the hadal zone in the ocean. The hadal zone is the part of the ocean that lies below 6,000 meters. The snailfish studied by the researchers were living approximately 7,000 meters below the surface. The researchers note that the bottom of the Mariana Trench is not very hospitable to life—it is completely dark, very cold and under extreme pressure. Prior research has shown that despite such challenges, there are many creatures living in the Trench—among them are snailfish, a top predator. The researchers were curious about the adaptations that have taken place with the hadal snailfish and embarked on a study of them. They first used a remotely controlled underwater vehicle to travel down to the bottom of the trench to catch some specimens and bring them back to the surface for study. 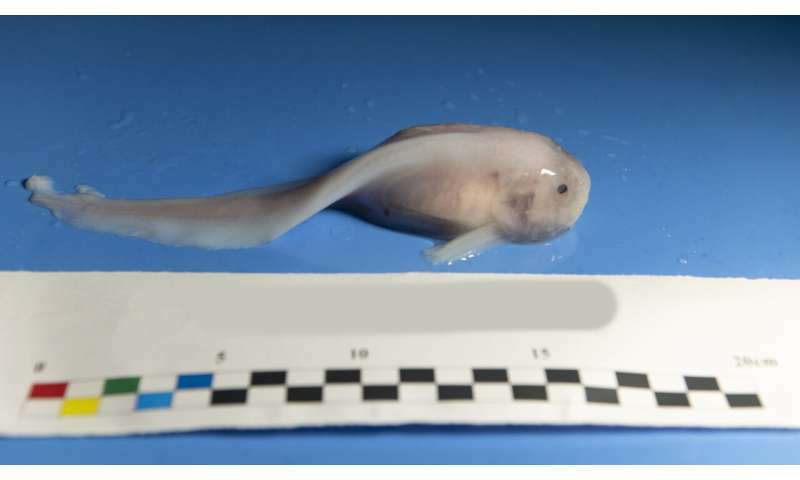 The team next carried out genetic sequencing of the genome which they compared with another closely related type of snailfish that resides in tidal ponds. The researchers report that the snailfish skeleton is made of cartilage, which is much more tolerant of high-pressure environments than bone. They found that the hadal snailfish had also lost some of its genome—those parts that confer light sensitivity, which makes vision possible. They note that other parts of the genome related to vision were still intact, however, suggesting the fish might still be able to see. They were also able to see changes to gene groups involved in producing fatty acids, which the researchers note would help cell membranes remain flexible at great depths. They also found other genes that appeared to have changed to prevent proteins from folding incorrectly under pressure.